I'm hard pressed to come up with another series that has been the cause of as much anticipation and excitement as The Lunar Chronicles has inspired in me over the past four years. I have loved every one of the books and have fallen pretty hard for these characters. This is the kind of series that you hate to see end. The Lunar Chronicles are science fiction retellings of classic fairy tales. With each book a new fairy tale and new characters are woven into the plot, creating an increasingly complex tale. The series is set in a post-World War IV world. The people of earth have lived in peace for hundreds of year, but are suffering from a devastating plague. Levana, queen of Luna (located on the moon), has an antidote, but she will only give it to the Earthens after her marriage to one of the rulers of Earth's great nations. Book one is a retelling of Cinderella. Cinder lives in the Eastern Commonwealth with her stepmother and stepsisters. She is feared and hated because she is a cyborg. Her skills as a mechanic, however, bring her to the attention of Prince Kai, and, though she knows she shouldn't and though she's afraid of what he'll think of her if he knows about her mechanical parts, Cinder can't help but fall for Kai. This, in turn, brings Cinder into the unstable world of interspatial politics. Book two adds Red Riding Hood into the mix. Scarlet Benoit's grandmother is missing, and Scarlet is determined to find her no matter what. She'll even team up with a rough street fighter named Wolf. Scarlet and Wolf's search takes them from the south of France to the streets of Paris. Along the way the two are irresistibly drawn to one another. And, while this is going on, Cinder is on the run and looking for answers. With book three, Rapunzel's story combines with that of our other characters. Cress has been trapped alone in a satellite for seven years. It's there than this genius and outcast spies on the people of earth for the Lunar government. But Cress fantasizes about life beyond the satellite and risks everything to help Cinder. Knowing that they need Cress's help, Cinder and her crew set out on a rescue mission. The final book in the series is a retelling of Snow White. Princess Winter is beloved by the Lunar people and said to be even more beautiful than her stepmother Queen Levana. When Levana orders Winter's childhood friend and true love to murder her stepdaughter, Winter is propelled into the path of Cinder's revolution. Marissa Meyer also wrote two supplemental books that are set in the world of the Lunar Chronicles and feature the main characters. I don't always read supplemental material, but for this series, I didn't want to miss a thing. Fairest is Levana's story. In it we learn about Levana's childhood and how she came to be the Lunar queen. It's always fun to read the villain's side of the story. Levana is a pretty terrifying villain. Stars Above is a collection of short stories that feature our main characters. Star Above came out in February 2016 after the final book was written, and I read it right away because I was not ready to say goodbye with Winter. It was so lovely to be with the characters again for one final sendoff. My immediate reaction to Cinder was, "Wow! Who knew that what I was missing in my life was a cyborgian retelling of Cinderella." I clearly fell hard from the beginning. The Lunar Chronicles are impressive in their scope, and they don't shy away from tough topics--death, disease, politics, oppression, impending war--but they also never fail to be a lot of fun. One thing that I love about this series is how every book builds on the next, not only in terms of plot, but also in terms of sophistication and intensity. 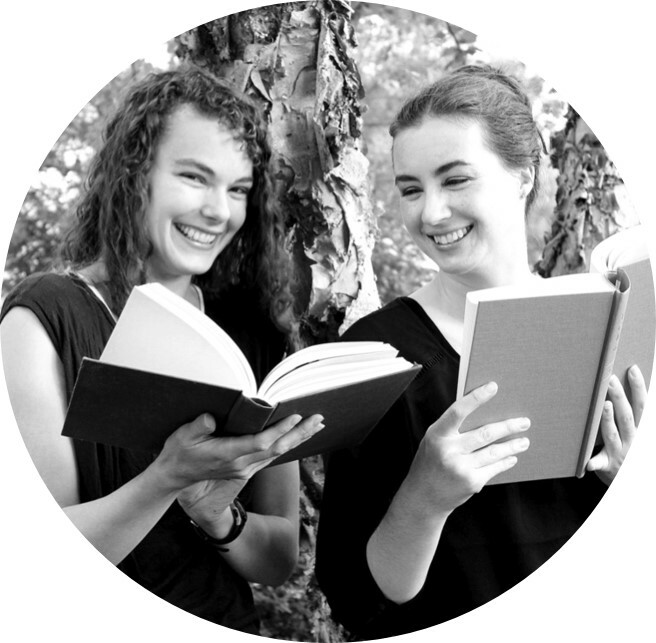 Each book introduces another set of characters and another fairy tale that are woven organically into the overall story. By the last book Marissa Meyer is juggling eight or so main characters and four fairy tales. The ensemble cast in The Lunar Chronicles is another thing that makes this series so much fun. I really, truly like all the characters, and I like how they all feel absolutely essential and fully formed. In the last book, I was very happy to see that every couple had a really satisfying moment. Although it's the characters I love the most in this series, I also am a fan of the world itself. 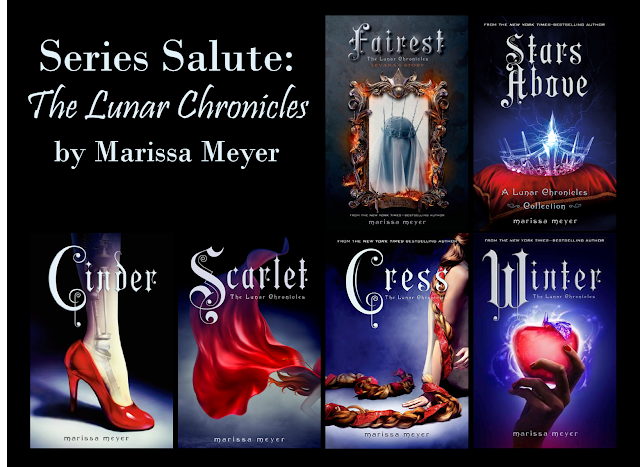 I like how Marissa Meyer brings these classic fairy tales into a futuristic setting. I listened to the audio version of every one of these novels. Once I start a series on audio, I like to stick with it. I highly recommend the audiobooks. The narrator, Rebecca Soler, is very entertaining and easy to listen to. P.S. Books from The Lunar Chronicles also featured here, here, here, and here. P.P.S. Lots of fairy tales here.